Frequent collaborator with The Presentation Arts Centre Anne Manning brings another exciting children's exhibition full of colour and personality to the centre. More details to follow soon! An exciting exhibition of work by the Young Creative students lead by visual artist Oonagh Latchford Art. December 2018 saw an exhibition of work by a selection of young people created during the Young Creatives Workshop Programme 2018, held at the Presentation Arts Centre Enniscorthy and lead by visual artist Oonagh Latchford. This body of work is the fruition of creative experiments and investigations by these young creatives and intends to showcase their creativity to the fullest extent. This workshop & exhibition of work is proudly Supported by Wexford Arts Centre and Wexford Local Development’s LEADER programme 2014-2020 supported by The European Agricultural Fund for Rural Development: Europe investing in rural areas. After exhibiting for the 3rd year in the Wexford Festival Opera, the gang also return to The Presentation Centre with Radio Opera. "Our process for around seven weeks began with a sample of a cardboard cylinder, Italian inventor Guglielmo Marconi, Croatian inventor Nicola Tesla and Enniscorthy born Annie Jameson. We discovered a hill called the Daphne and a pond called The Still. We explored these connections through images, video, form, balance, colour, wire and sound. We connected locally. These concepts and experiences have formed this visual art exhibition - 32 radio sculptures. This exhibit speaks to the individual aesthetic and choice of each child. To have each child’s work displayed in our neighbouring town Wexford during the Opera Festival and again in our local arts centre further acknowledges their work, their experiences and effort. This is an amazing display of quirky colour and possibility that is not to be missed!" 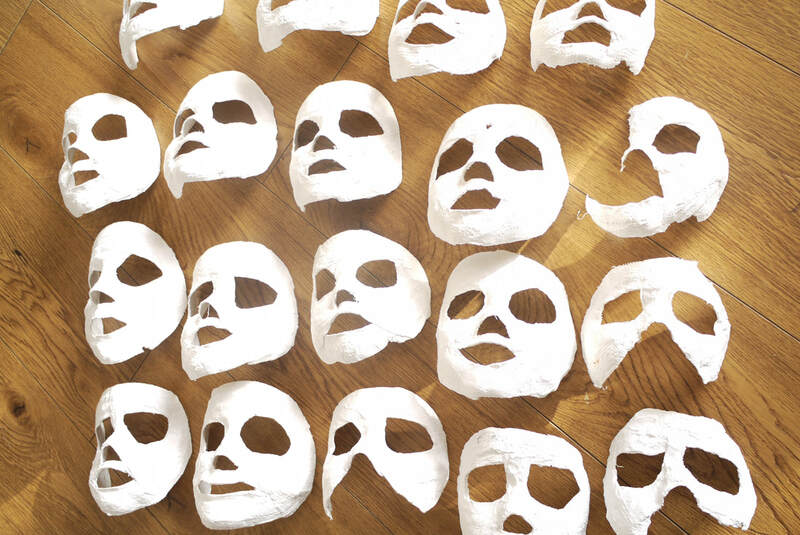 Created by the children of Carraig Briste & Killegney Early Years, guided by Visual Artist Anne Manning, these current 47 masks are the visual representation of many connections, through our conversations, meditative experiences and memory through process, mutual respect and choice. The willing participation of this early years visual art exhibition throughout the child's local town is creating huge excitement within the community of the school and through the business's of Enniscorthy. As we visually explored Eileen Gray’s furniture design and then Mainie Jellett’s cubist style of painting through an example of Ceadogán Carpets, we began the process of creating our own individual and functional life-sized chairs. Guiding Artist - Anne Manning. Art teacher Natalie Doyle presents Our Town Through Our Eyes, a project by 5th Year Leaving Cert applied students at the Enniscorthy Vocational College. The project is based on the work of Michael Craig Martin and has inspired the students had to create a collage of images, three positives about Enniscorthy and three negatives. This thought provoking exhibition provides an insight to the perspective of the youth in Enniscorthy. The temporary exhibition 'Our Town Through Our Eyes' was on display for ten days and was enjoyed by many. 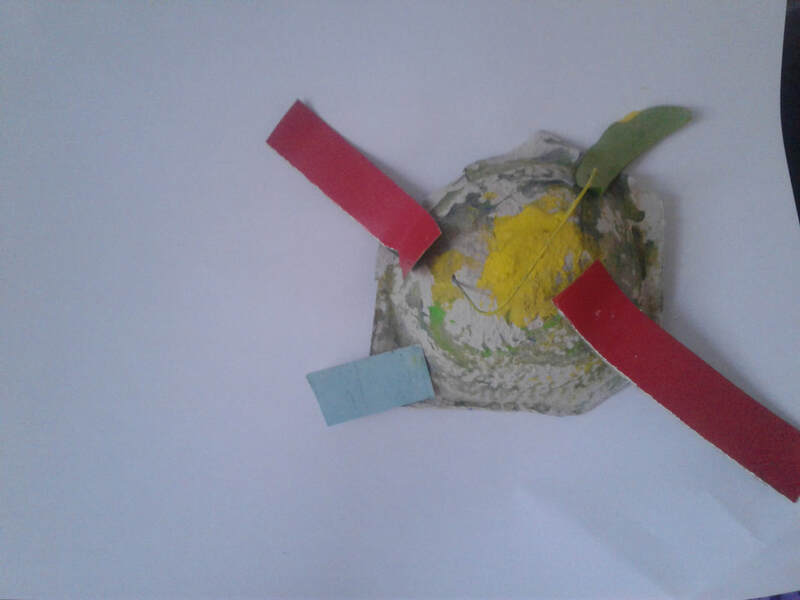 Twenty nine montessori preschool Children of both Carráig Briste and Killegney Early Years, Enniscorthy, through this exhibition, have come together to present an exhibition of functional art. 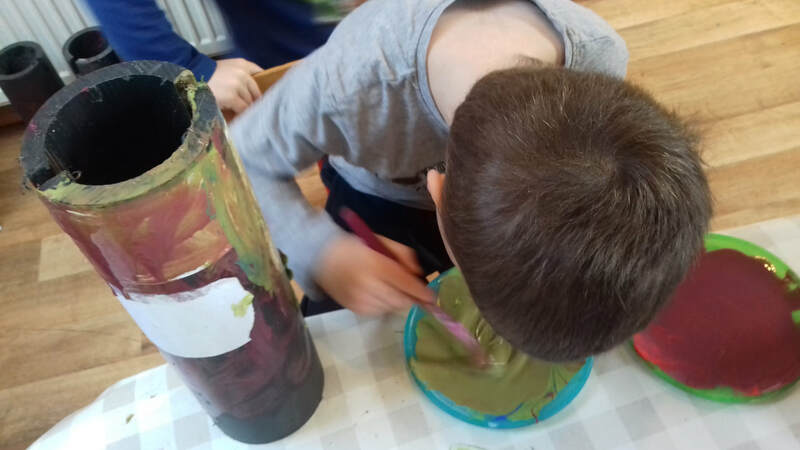 The children began in early September painting recycled cardboard cylinders indoors and outdoors. They learned about balance and why a level surface is needed for the cylinder to stand. Once a week the children were offered the opportunity to work on their individual cylinder - applying a mixture of two primary colours while at the same time verbally and visually exploring the concepts of the secondary colours. Then using collage techniques applied textures of organic and man-made materials. Together we turned the cylinders into side tables. The children have visually explored furniture design by the late Eileen Gray who grew up outside Enniscorthy town. Enniscorthy boasts a castle with a room dedicated to her architecture and furniture design. Through this exhibition I hope each child will have gained a holistic experience of their own participation and connections to the artistic processes involved. I would like to commend the children for their artistic work and enthusiasm for the side tables’ function & also appreciation for their individual artistry, aesthetic and design. – Orlagh and James Doyle (Carráig Briste, Templescoby Enniscorthy,- Killegney Early Years, Killegney, Enniscorthy). Exhibition of Side Tables 2016 – Lisa and Emily at the Presentation Centre Enniscorthy. Also to all the staff and parents/guardians for their care and attention of these exploring, thinking and creative minds. In our own time is an eclectic selection of work by artists featured on RTE's Painting the Nation; Alan Ryan, Louise Tracey, Dave Monaghan, Sinead McCarthy, Agnieszka Ryan, Kevin McCann & winner Sinead Lawless. The Exhibition has been on tour since October 2016 and has visited Dunamaise Arts Centre, Portlaoise, the Schoolhouse Gallery in Enniskerry, The Elms, Punchestown Co.Kildare and the Village Hall in Co. Cork. The Presentation Arts Centre Enniscorthy is the Exhibitions last port of call in 2016 and boasts a wide selection of work from the seven artists featuring portraits, landscapes & sea scapes in mediums such as; oil, acrylic, watercolour & print. In our own time aims to celebrate creativity and promote artists nationwide reminding us that art is for all. In Our Own Time opens on Saturday 3rd December at 3pm with wine reception and opening evening at 7pm running until Wednesday 7th December at 5pm. Originally from Kilmuckridge Co.Wexford Lisa now lives & works in Enniscorthy. Lisa has studied at the Gorey School of Art and has a Bachelor of Arts Honours Degree in Visual Art form Waterford Institute of Technology. Lisa is currently the Visual Art Manager at the Presentation Arts Centre Ennisorthy where she carries out her role as Visual Art Programme coordinator and exhibition curator with the Wexford Arts Centre. Christian was born in Caerphilly South Wales and grew up in the mining village of Bedwas, he is now living in the beautiful fishing village of Kilmore Quay Wexford since 2001 where his grandfather is from and where himself and his twin brother spent some of their childhood. He creates to be in touch and connect with his surroundings. He feels art is very personal and most of all should be enjoyed and celebrated by invoking a reaction in people, his art is influenced by emotions and personal experiences throughout his life. He works primarily in oils and acrylics on his own canvases, mostly in a contemporary unframed style. He also works in wood and mixed media. Christian had his first one person exhibition in Ireland at 'The Pig Yard Gallery' in Wexford town in 2013, since then he has exhibited in the wexford area in various exhibitions and shows, he also works on private commissions. He completed a BTEC first diploma in design and also a BTEC National diploma in general art and design at Risca school of art (Crosskeys College) and then went onto graduating with a B.A. (Hons) degree in Visual Art and art history at the University of Glamorgan. He has been influenced and inspired by various artists such as Wassily Kandinsky, Rembrandt, Vincent Van gogh, Pablo Picasso, H.R. Giger, Simon Bisley and Carlos Ezquerra to name just a few and various movements like Art Deco, Art Nouveau, Impressionism, Post Impressionism, Cubism, Expressionism, Dadaism, Surrealism and Pop Art.